Processed Foods: Is It Ever OK to Break the Rules? 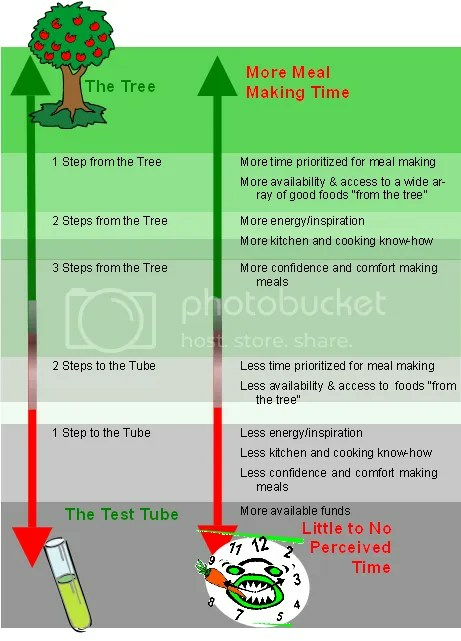 Yesterday’s post introduced the “Tree to Test Tube Continuum” to help understand just what “processed foods” are. The Continuum makes it easy to see the difference between those foods on the tree end (which we want to focus on) and those on the test tube end (which are best to avoid.) The trickier part of the continuum lies in the middle zone, where green merges into gray. Is it OK to eat anywhere in this zone? Here’s the approach I take: Eat as close to the tree as possible, given my time constraints. Taking advantage of the convenience of minimally processed foods on the Tree end of the Continuum is far less worrisome to me than rigidly adhering to a no-processed-food-prohibition to the point where I’m exhausted and turn to Test Tube foods out of desperation. Access to real foods, cooking confidence and inspiration, and funds availability also factor importantly in our processed foods decisions. Putting the Tree and Time Continuum side by side helps illustrate how I deal with the mid-zone. When pressed for time, I break the rules and use foods from further down the continuum, but only to the extent necessary and only from the light gray section up. Dinner, for instance, is our most important meal, so I give it the most time, attention and energy and use foods within 2 steps of the tree: Vegetables cooked or raw; brown rice rather than white; meat, beans and eggs cooked as necessary; nuts and cheeses; and flavorings made from scratch: lemons, limes, herbs, spices and minimally processed soy sauce, olive oil, fish sauce, etc. I have less time and inspiration for breakfast and lunch, so I step a little further from the tree, using some frozen foods, some leftover foods and some ready-made soups and sauces. BUT, I use frozen foods that contain only vegetables, fruit or meat (no Methocel-rich sauces!) and ready-made soups and sauces containing only ingredients close to the tree that I would combine myself. I keep snacks to a minimum by eating three solid meals a day. To the extent I want something between meals, it’s usually a bit of a leftover meal, some nuts, fruit, a piece of whole grain toast, etc. In my tea, I have soy milk (definitely processed, but a treat for a non-dairy person) and honey from the tree and some bees. but with the all important understanding that all these factors (time, know-how, energy and inspiration) are changeable. It IS possible to gain more time by changing grocery shopping habits and locations, increase know how by learning more about whole and natural cooking, get a jolt of inspiration by treasure hunting for a new ingredient or flavor and take advantage of dozens of other KitchenSmart Strategies(R) that allow for a gradual shifting closer and closer to Tree Land. Ever wonder what a no-processed-foods-meal looks like? They may be easier than you think! Check out the next post for an easy example. Don’t stay mired in Test Tube Land any longer than you must! Whole Kitchen Cooking Classes are designed to make you feel comfortable and confident cooking whole and natural foods–and the more we feel confident about having the time and ability to make meals that interest us, the more we can take advantage of wholesome foods closer to the Tree. Check out the current class schedule.